My day began by waking early…still on Africa time. A great benefit to the time adjustment is more sweet hours with the Lord in prayer. There is just something so special about the hours just before daybreak. This morning I sensed a deeper presence of the Lord…can’t put my finger on exactly what brought it on, I just realized this morning was different than other mornings. There was a great sense of anticipation…but for what I did not know. Leaving home, heading to church, once again I sensed the Lords presence…driving along while the morning sunlight was bursting forth through the fall colored leaves…the beauty of His creation was all about me. He began to speak to my heart about how He creates a new day every day. No day is exactly like any other day…they are unique. I began to think about my own daily life-what was I doing to ensure that the Lord has the opportunity to create something new and unique in each of my days. I began to pray and asked the Lord to create something new in me today…move me from any spot in my life that I have become complacent. I guess some would think that serving on the foreign mission fields of Africa would be enough, yet, I experience the same struggles there as here on American soil…the struggle of complacency. I often think that the struggle is more difficult there simply because I spend the most time alone without the blessings of church services I can understand, healthy bible study groups and other activities that aren’t available to me over there. My walk and growth with the Lord is dependent on my holding myself accountable and that is where I find myself becoming complacent. Yet, complacency is the last thing I want for my life. Also, I can see where becoming discouraged pushes me towards complacency…and without a doubt this past week I experienced the most discouragement I have experienced since going to Africa to serve. This last bout of Malaria took its toll on me…. I began to question if I could continue to withstand these frequent bouts of Malaria. I felt as if I could no longer physically deal with being sick yet once again and this made me very sad. You see, I know I am called to serve in Africa and I’ve tried to be obedient, so to begin to have thoughts of I can’t do this anymore was very hard for me to accept. It is so clear to me now that I was becoming complacent… Malaria had become a way of life for me and instead of turning it over to the Lord, I was adjusting my life to accepting it as part of life there. Yet in a very special church service this morning I let go of that complacency and I accepted and believed in the prayers that the church prayed for me. I attended church at The Grove this morning where I joined my brothers and my sister for the first time in over 10 years in the same church for a Sunday morning church service. My sweet niece Lecia and her husband Jeff who pastors there took us into the presence of the Lord with incredible praise and worship…and then…God did an amazing thing! I hadn’t talk to Jeff about my discouragement… yet, my heavenly Father knew and He knew Jeff and Lecia and this body of believers would come to church this morning prayed up and ready to see what God was going to do today. Jeff called for me to come down front where I stood in the middle of a group of amazing prayer warriors and there is absolutely no doubt left in my mind that this morning God healed me. Not only did He heal me physically, He restored me spiritually and answered my prayer to come out of any area of complacency in my life. While this body of believers were praying….my body became internally hot…it was a physical feeling, and even though I didn’t know exactly what was happening, I knew God was doing it. I don’t know all the people who prayed for me this morning, but God knows…His children served Him well today and a difference was made in my life. All glory, honor and praise to our God for what He did in my life today. He is taking me forward on to our next journey….what an incredible life I get to live…. It’s been a bittersweet day saying bye to my African family and friends. All throughout the day I felt so much love from so many who came by for a visit before we leave out in the morning headed back to the states. Although I felt much love, I was a bit sad knowing it will be a couple of months before I get back to see them. The hardest one of all as you can imagine was Jimmy….it is like leaving one of my children behind. I sure love that boy and am most blessed to have him in my life. Okay…I’ve had to write about Malaria so many times lately that I don’t really know much more to say, other than I am sick again. Yesterday the fever came back and this morning I went back to the hospital for more tests. The outcome has given me some insight to why I might not have been getting well. Today the doctor tested me again and the results were negative. He said he knew because of the continuing symptoms that I had Malaria…then he thought to ask me a great question. He asked if I had taken anything for the fever before I was tested and I told him yes. He then told me that it is possible for the test to be altered when other medications are being taken. So, now it seems we have some answers….I have taken something for the headache or fever many times before I was tested. Today I began injections that will last for the next 5 days. The doctor assured me today that these injections will heal me….please pray for this. Last night and this morning I was the most discouraged I have been over the situation since I first contracted it in June. Dr Brenda, Mike and Sarah and George and I will all be leaving out first thing in the morning. We arrive in Atlanta Thursday mid afternoon. Please be praying for our safety as we journey home…and pray specifically for me to endure the trip well as I am still running a fever and experiencing headaches. Also, pray for my sweet Jimmy…. This is my first trip home under normal circumstances….I am so excited! Can’t wait to get my arms around my children and my grandchildren! How blessed I am to be home over the holidays when our family is together more than any other time of the year. And to come home in the fall of the year….can’t wait to step out the door at the Atlanta airport and feel the coolness in the air! As always I am so thankful for all your prayers and support. Today my Pastor friends came from Kenya and we started planning my teaching time when I get back the first of January. I am very excited to have the opportunity to serve in Kenya for several weeks as the National elections take place here in Uganda. Sure love all of you lots and look forward to hearing from you when I get back home in a couple of days. It has been an amazing couple of weeks. Once again it is such a joy to serve the Lord with my son Bryan. He along with my dear friends Jimmy Wallace and Joel Cobb who are like family to me, and they make it seem much like home around here! I’m not sure of the exact order to write the events of the past few days….much has happened that has been unusual..yet without a doubt each of us knows God has been in control, although some of the events have been hard to understand. God allowed me to once again experience Malaria…so now I am thinking….surely 3 times has to be enough!!!! As both of the other times, I visited the local clinic for testing and the test results were positive. However, this time, after finishing the medicine, I was not better. 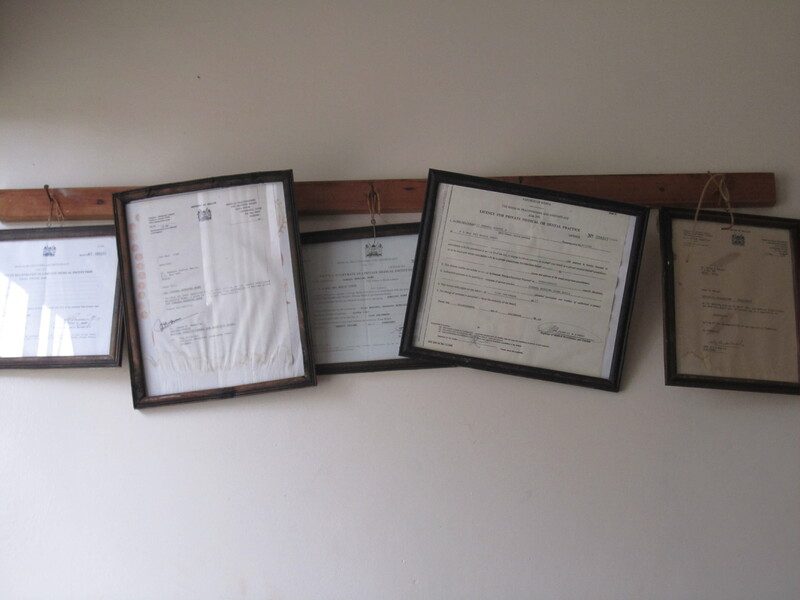 So, I traveled over into Kenya and was examined by a real doctor….he actually has a license hanging on the wall! License for doctor...hanging on hooks with thread! He said the medicine I took last week wasn’t effective, so he took me up the next strongest dosage. I started the medicine last night and by this evening I could tell I was getting better. 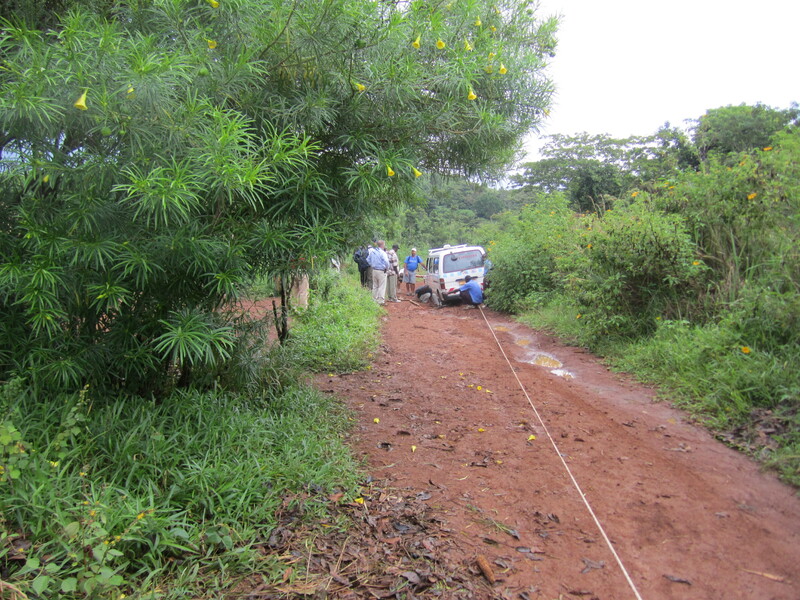 Although I have been ill with Malaria, I have been able to participate in much of the activities. I’ve only had a couple of days where I just couldn’t keep up. Last night was one of those nights I would have gone out with the team regardless of how I was feeling. God graciously gave me the strength and endurance to travel to a bush church and hear my son Bryan preach his first sermon! 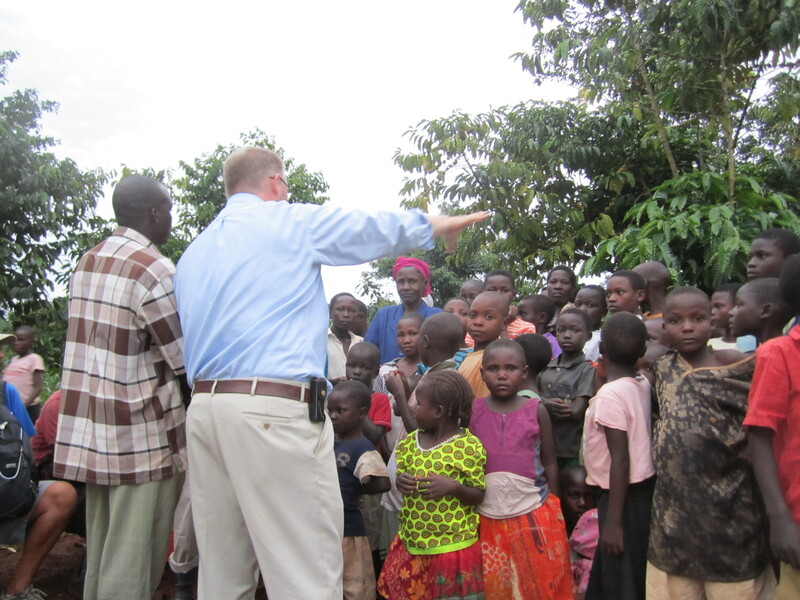 WOW….God spoke through him and many were saved! I was thinking about how proud I was when he won his first ballgame, and when he won his first wrestling match…the day he became a born again Christian….the day he married….the day he became a father….and now the day he preached his first sermon! What a joy it has been to watch God bring him to the place He always knew He created him to be! 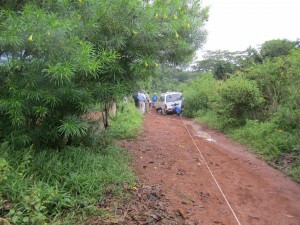 When we headed out to the bush church for service, both of our vans got stuck. Without a doubt it was a fun adventure…well maybe not for the guys who had to get out in the mud and push us out…but it was hilarious! The second van got stuck trying to pull the first stuck van out. It was disappointing to have to turn back knowing the church where we were scheduled to attend would be greatly disappointed. As we started back a decision was made to stop at a church we had passed on the way. A group of Christians were there and we had stopped on the way and greeted them. When we went back there, God showed us that this is exactly where we were suppose to be! All week God has changed our plans to align us up with His perfect will. 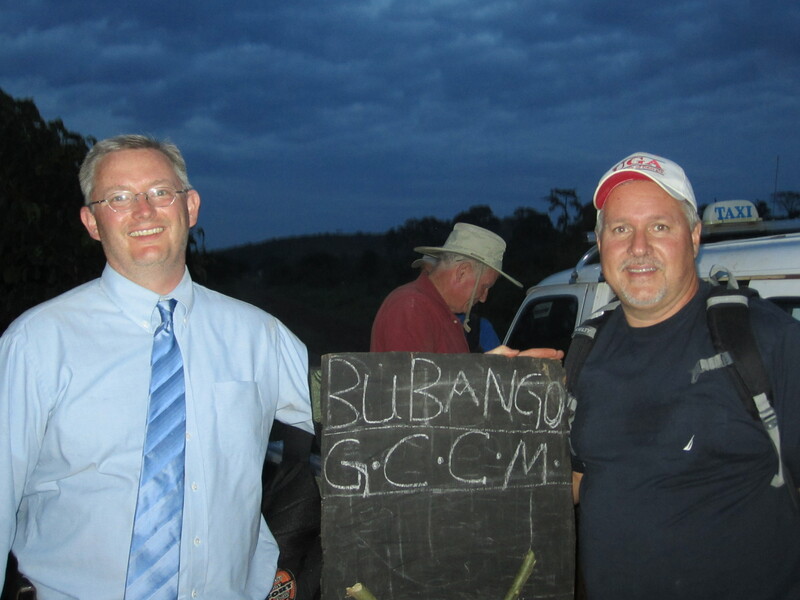 Last year when I traveled to Busia with a team, I had the privilege of making a great friend named Jeff Sheppard who was a part of our team. One of the greatest blessings of traveling on mission trips is the friends you make along the way. Jeff was no exception…and since that trip I have looked forward to his returning and serving here once again. He arrived here last Thursday afternoon and was super excited to be back. 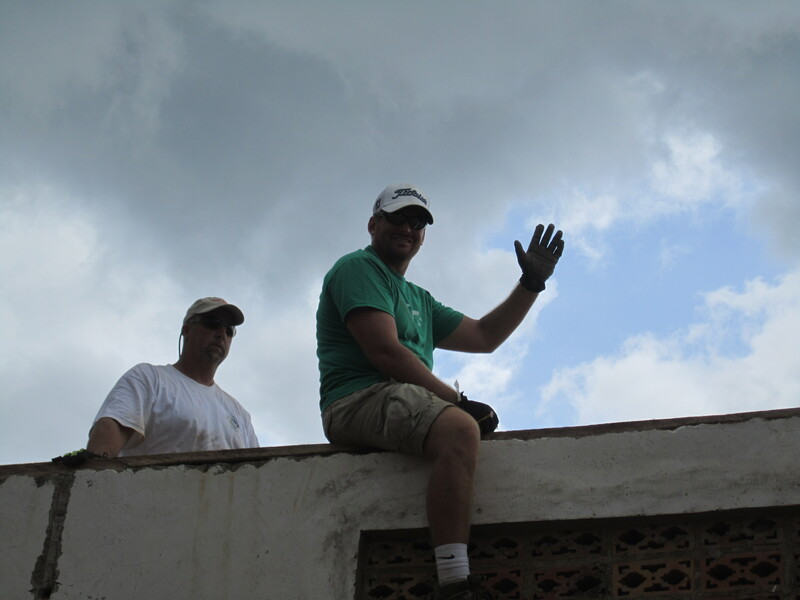 He was looking forward to being a part of the construction team putting the new roof on our church. On Friday things were going great….the construction team was making great progress when Jeff had a terrible accident. He was on top of the church wall helping bring up the first truss when he fell 20 feet. He was rushed to the local hospital in the back of a dump truck but the power was off so he was transported to a hospital in Kenya that could take the necessary scans and x-rays he needed. God truly protected him…although he has spent the last 6 days in the hospital; he had no broken bones or internal bleeding. Yesterday a nurse flew in from the states and today they flew out headed back home. 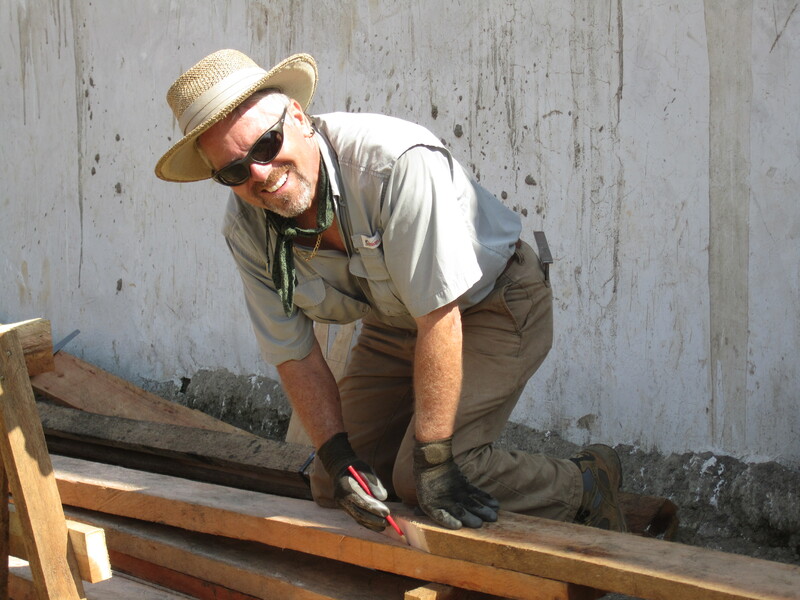 Please remember Jeff in your prayers….he was very disappointed not to be able to come back here and complete the mission with the team. He continues to seek the Lord and is trusting that God has a plan for allowing this to occur. It’s been good to be a part of the awesome team God has sent here, as well as the team of people back home who are praying for us and made it possible for so many of us to be here. One of those people back home is my friend Trevor Cain. 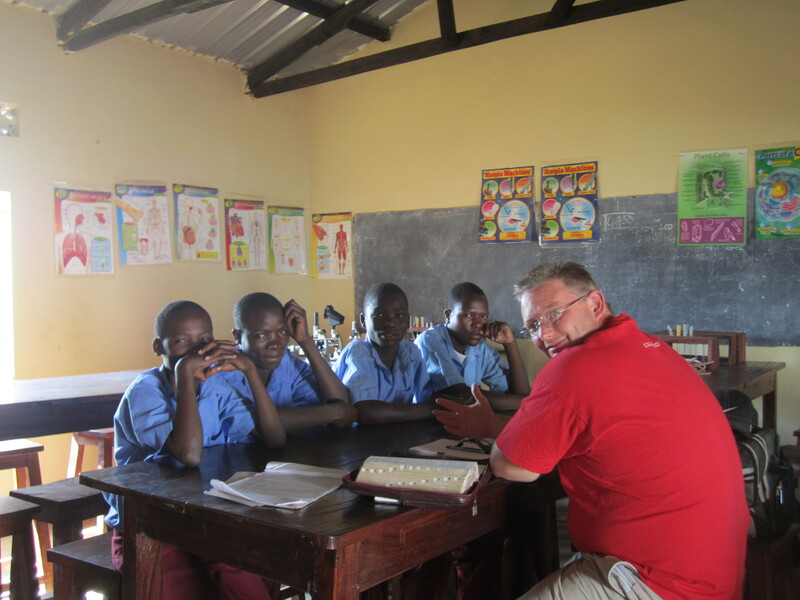 Trevor has been here to Busia on 2 different mission trips. One of the blessings Trevor has given to us here is some new bibles. We have so many pastors who do not have a full bible. Some have a New Testament, but very few have both the old and new testament. This week I was blessed to hand out the bibles to many of the Pastors here. Here are pictures of Pastor Patrick and Pastor Samuel who oversees not only their own bush churches, but 18 others as well. 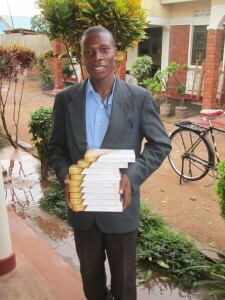 I asked Pastor Samuel how many of his pastors had full bibles and it made me sad when he told me that only 4 had them. I ask him what did they do to prepare for preaching and he told me they would use the bible of one of the church members, if a church member had one. Now all 18 pastors have a full bible….I can only imagine how their flocks are going to grow now! the sponsor packets have been distributed…the children have been taught…. Bryan discipling high school students..
and more than 10 bush churches have been visited and many have come to know the Lord. Tomorrow will be the last full day for the team and we are anticipating much work to be accomplished. Safety has not been an issue. We have adjusted to having armed guards and riding in a vehicle every where we go instead of walking. I have learned that in January and Febuary there will be the threat of violence all over the country of Uganda as the National elections take place. We have been advised that this will not be a safe time for me to be here. My friends here that are Kenyans but teach at our school and live here on the Uganda side of the border have told me that even they will flee back to Kenya until the elections are over. I am planning to leave as scheduled the first of January and head back to Africa, but I will go to the Kenya bush for January and February to teach women’s bible studies as well as leadership. It has been something I have been praying for the opportunity to do and am looking forward to ALL God is going to do! Please remember my Uganda family and friends in prayer in the months ahead as events such as this election bring uncertainties to them and their families. I’ve arrived safely to the mission compound here in Busia. It has been a beautiful day as I’ve traveled from Entebbe to Busia. I never tire of the beauty of this amazing country I am blessed to serve in. I’ve met lots of different people since coming to Africa, but tonight I said hello to my first armed guard! I am sitting here chuckling because it seems so strange that this could possibly be my life now….yet, it is! I’m tired and need some sleep but I just couldn’t go to sleep without giving praise to the mighty God I serve! When I first went out to meet Duncan I felt apprehensive. Seeing him standing at the gate with his gun on his shoulder didn’t put me at ease at all! But then he started talking to me and I stood there stunned at what he said. He told me that he had been informed that I requested a Christian guard and he wanted me to know that he was a ‘born again” Christian and shared his salvation experience with me. He told me about the years he served as a soldier and how one day he understood his need of God in his life. I truly didn’t know what to say…this is a man who guards people for a living and works for a company that employs people with all types of religious and other backgrounds and God made him available to guard me! Peace overtook me as Duncan told me he considered it a great honor to guard a fellow believer! Yet, the most wonderful thing he said was that he wanted me to know he was here to guard and protect me, but more importantly he was trusting the Word of God that he carries in his pocket while he guards to protect us! He said that I might look out some time and see him with the flashlight and he wanted me to know he does it many times during the night, using the flashlight to read his bible! 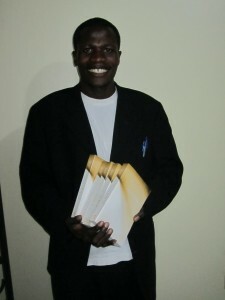 What a joy it was to tell him I had just brought commentaries and many other bible help books and he could use them! Tonight I’m thinking of the little but powerful song my little granddaughter Sarah sings….MY GOD IS SO BIG, SO STRONG AND SO MIGHTY, THERES NOTHING MY GOD CANNOT DO! Although I was dreading the thoughts of having to have an armed guard, I now see that God knew exactly what He was doing and what I needed….it will be great to see what God is going to do next! I have wonderful news to share about my grandson Caleb. On Wednesday evening while I was flying back to Africa, Caleb made the most important decision he will make in his lifetime…..he surrendered his life to the Lord. My daughter (Caleb’s Momma) wrote me a message to share this incredible news. She wrote…..”Just wanted you to know that while you were as close to Heaven as we can get, flying back to Africa, your sweet little Caleb secured his spot there”. Now just my little granddaughter Sarah who is 5 and my grandson Isaac who is 3 are remaining to secure their spots as well…then all of my precious family will one day spend all of eternity together! Thanks for all the prayers over the past few weeks….please don’t stop. 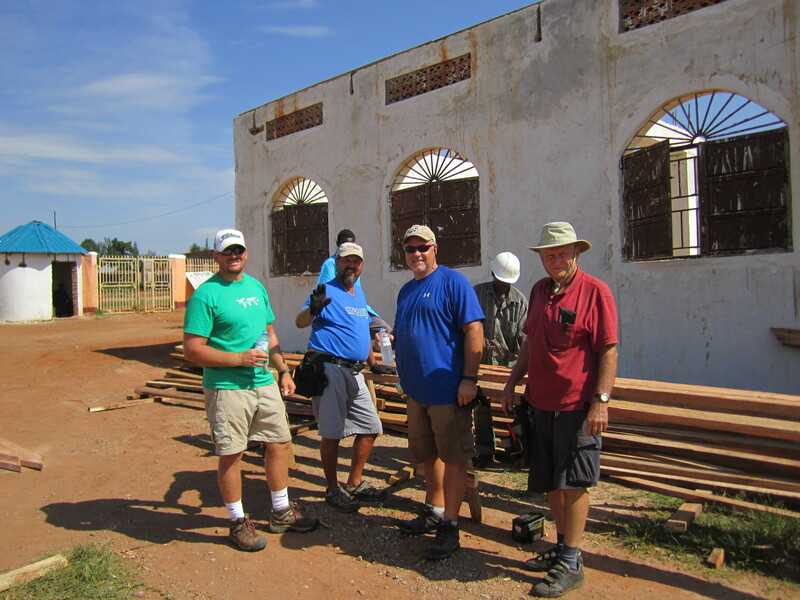 We have team members in transit now and the rest will arrive next Thursday…which includes my son Bryan! God is doing some wonderful things all around me! The Life and Mission of Joy Breedlove is powered by	WordPress 3.4.2 and delivered to you in 0.168 seconds using 38 queries.